Sebastian Vettel, who trails Lewis Hamilton by 34 points with five races left this season, gave his fading title hopes a boost with a lightning late dash in the morning as the rain began to fall. 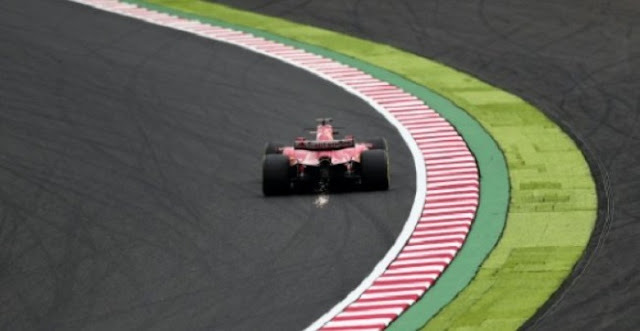 SUZUKA (JAPAN) - Ferrari's Sebastian Vettel set the pace Friday for the Japanese Grand Prix with a blistering drive in the morning's free practice before rain caused havoc in the afternoon. Lewis Hamilton splashed gingerly to the fastest time of a soaking second session after an absorbing morning run-out in Suzuka. Delayed by 50 minutes as rain lashed down, the afternoon looked like being a complete washout as team engineers amused themselves by floating paper boats along a river of water gushing down the pit lane. When the cars did finally creep out, puddles made the going treacherous but Lewis steered his Mercedes to the quickest time of one minute, 48.719 seconds. Vettel topped the timesheets in a morning session which was temporarily disrupted after Carlos Sainz smashed his Toro Rosso into a wall. Vettel's time of 1:29.166 was almost 20 seconds quicker than Hamilton's wet run, the German edging out the Formula One championship leader and Red Bull's Daniel Ricciardo. None of Hamilton's title rivals posted times in the afternoon when Lance Stroll had a lucky escape after his Williams aquaplaned off coming into turn one, forcing the Canadian to take evasive action to avoid hitting a barrier. Only four other drivers did set times, Esteban Ocon's Force India going closest to three-time Japan winner Hamilton with a 1:49.518. Vettel, who trails Hamilton by 34 points with five of the 20 races left this season, gave his fading title hopes a boost with a lightning late dash in the morning as the rain began to fall. Ferrari team mate Kimi Raikkonen was the only other driver to join Vettel, Hamilton and Ricciardo in breaking 1:30, despite complaining of overheating brakes. Valtteri Bottas, like Hamilton running an upgraded aerodynamic package, registered a 1:30.151 for Mercedes with Red Bull's Max Verstappen -- who stunned Hamilton to win in Malaysia last weekend -- sixth fastest. Vettel, who finished fourth in Sepang after starting from the back of the grid, faces a potential must-win race at the fearsome figure-of-eight Japanese circuit, where he won four times with Red Bull. Verstappen had a fright in the morning as he slid off onto the gravel before Sainz skidded into a tyre wall after exiting the hairpin, mangling his Toro Rosso and bringing out the red flags. Ocon and Renault's Nico Hulkenberg were seventh and eighth quickest, while Romain Grosjean's Haas and the McLaren of Stoffel Vandoorne rounded out the top 10. Ferrari's Sebastian Vettel set the pace Friday for the Japanese Grand Prix with a blistering drive in the morning's free practice before rain caused havoc in the afternoon.